Finn Blythe: I read your Mother taught you to sew – how does that nostalgia of making things together with her come through in your clothes today? 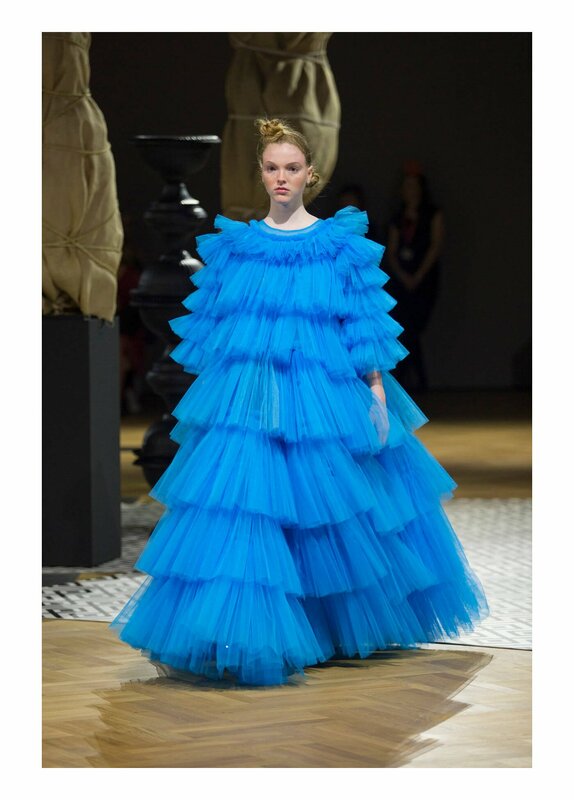 Molly Goddard: My Mum alwasy put me in posh smocked dresses, which were from charity shops or passed down through the family but I wore them every day to play in the park, never for anything special. I think that attitude to precious clothes and dresses not being something too fussy has really stuck with me. She used to make me these simple dungaree dresses but covered in rik-rak or in an amazing print. FB: Why is scale an important theme in your collections? Why does it interest you? MG: I’m not really sure, when I was younger I always loved looking at haute couture shows, John Galliano at Dior especially, I always saw the volume and fabrics and maybe that’s where it came from. Something about seeing how much fabric you can physically put into a dress really excites me, I like the impracticality of it, but at the same time making it wearable by using a very light and synthetic fabric. FB: How did Louise Wilson help you during your time at CSM? FB: The show is free and available to all – quite a change from the ultra-exclusive viewing that we see during fashion week. Are there any changes you’d like to see in the way we consume fashion shows? MG: I think it’s so brilliant to have a show that anyone can come to, and it’s fun for me to view it in a slightly different way – as more of a show than a fashion show to promote a particular collection. I do think it’s something there should be more of, but I think fashion exhibitions, like what they have at the V&A, portray fashion really well for people who aren’t involved in fashion. I am torn though, because I think it’s wonderful for a show to be accessible in this way, but a part of me feels that there is something to be valued about the exclusivity of fashion shows, I feel it contributes to their intrigue and ability to really excite and inspire – which is something I loved so much growing up.